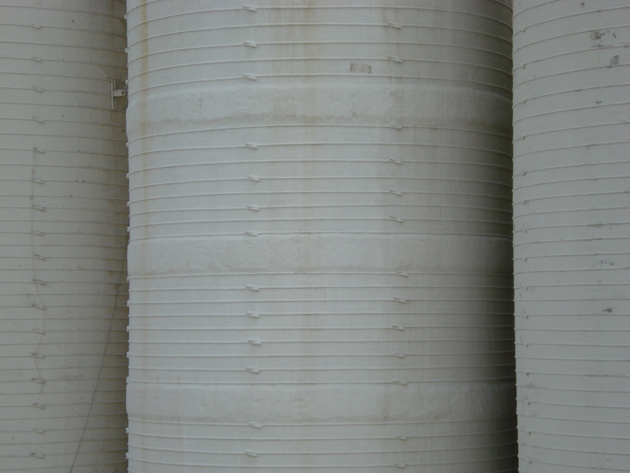 Structurally unsound silos jeopardize the safety of your stored materials. Whatever your silo repair or modification need, Marietta Silos is ready to help. We perform services for facilities storing bulk materials such as, borax, carbon, black cement, clay, clinker coal, fly ash, foundry sand, grain products, gypsum, lime, palletized fly ash, salt, soda ash, and more. No matter what type of structure you have or the material stored, count on Marietta Silos to solve your silo’s structural problems. 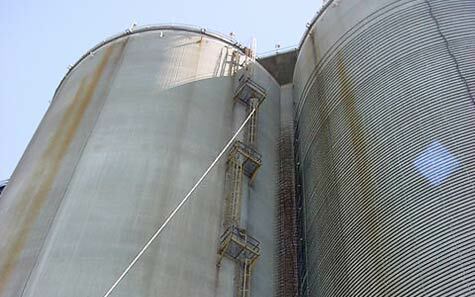 Marietta Silos has more experience in silo repair than any other company in the United States. If you have known or suspected problems, contact us for efficient, cost-effective solutions. Vertical silo spalling, cracking or wall separation due to overstress of the horizontal reinforcing are the main symptoms repaired with post-tensioning—a very common problem. To solve this issue, Marietta Silos will install high-strength post-tensioning strands around the wall exterior. These strands can replace all of the original steel reinforcing and, assuming the concrete is still sound, the silo can be returned to its original load capacity in an economical manner. As with any structure, the roof of the silo generally receives the brunt of the physical and environmental abuse. Proper roof maintenance is needed to keep the materials within the silo safe and dry. Roofs are subject to abuse from overfilling, explosions and overloading, as well as environmental abuse. Marietta Silos uses a variety of techniques to replace, repair or modify your silo roof so it can continue to meet your needs. 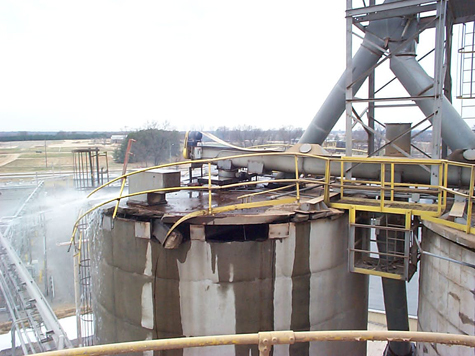 Marietta Silos has vast experience in rehooping concrete stave silos, whether they store foundry sand, lime, clay, cement, grain products, or have been adapted for industry use. 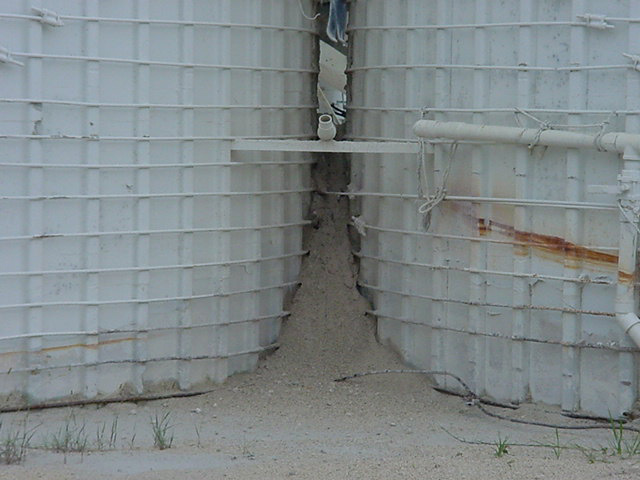 Older stave silos often have hoops that are corroded, damaged or missing altogether. In order to maintain the structural integrity of the silo, removing unsound hoops and/or replacing hoops with a full complement of new steel hoops may be necessary. If only a few hoops need to be repaired or replaced, Marietta Silos can do that too. Rehooping can ensure your older stave silos regain or maintain their full storage capacity. A special waterproof coating may be applied after rehooping to ensure the long-term durability of the hoops. Gunite is a mixture of sand, cement, and water, which is applied with air pressure. Not only is it as strong as poured concrete, it is also very resistant to weather and chemicals and bonds 100% to well-cleaned concrete. The satisfactory application of gunite is not for the layman. Fortunately, Marietta Silos has the experience necessary to complete the job to your satisfaction. 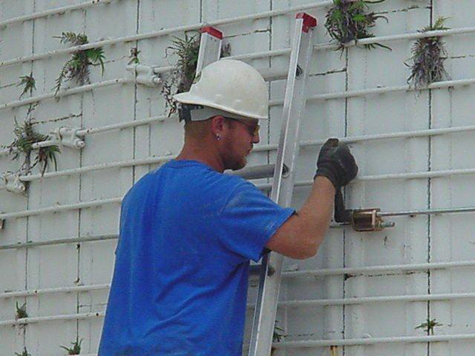 Marietta Silos is a certified installation contractor for the Wabo® Composite System. This system uses composite fiber reinforcements to strengthen existing concrete and masonry structures for a variety of applications. Available materials used include standard and vapor permeable resins, as well as specialized fibers with low conductivity, chemical, and impact resistance that may be mounted on or near the surface of the structure with no heavy equipment needed. If your silo needs to be dismantled, Marietta Silos offers the latest in demolition techniques to ensure a safe and economical work site. Marietta Silos believes it is important that you have options every step of the way and silo and tank liners are no different. 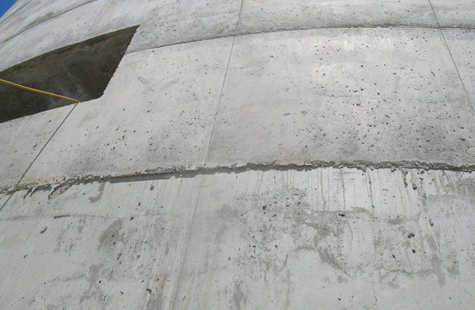 Silo liners can help restore the structural integrity of your silo, seal walls and floors from leaking materials and prevent material contamination. We offer liners in several varieties, including concrete, steel, stainless steel, epoxy, PVC and waterproof coatings. Steel silo repairs typically involve cutting out and replacing worn or corroded portions of a silo as well as relining damaged silo sections. 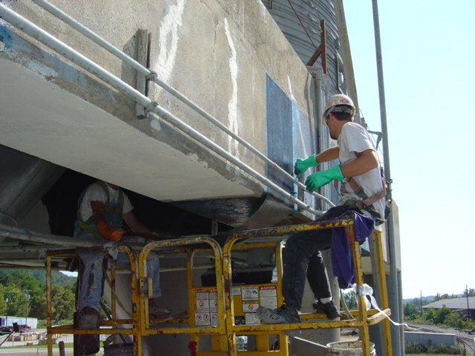 Marietta Silos handles the full design and engineering of steel silo repairs, with safety as our first priority. Our experienced engineers understand your unique loading and load path requirements based on your silo type and stored material. We take loads on your silo and cone into account during every project so you don't experience a silo failure.